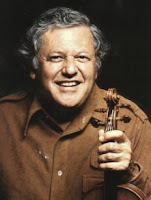 Ruggiero Ricci is an Italian (some would say American) violinist, writer, and teacher born (in San Bruno, California) on July 24, 1918 (Heifetz was 17 years old.) He is one of the last great living (legendary) violinists of the Heifetz era – Ivry Gitlis, and Ida Haendel being the other two. He was a child prodigy who first studied violin with his father. At age seven, Ricci studied with Louis Persinger (who also taught Isaac Stern, Yehudi Menuhin, and Zvi Zeitlin, among others.) Later on, Persinger was also his piano accompanist for many recitals and recordings. One of Ricci’s other teachers was Adolph Busch. His first public performance took place in San Francisco in 1928, at age 10, playing works by Wieniawski, Vieuxtemps, Mendelssohn, and Saint Saens. At age 11, he made his orchestral debut with the Mendelssohn concerto and later that same year gave his Carnegie Hall debut in New York which solidly established him as a virtuoso concert violinist. 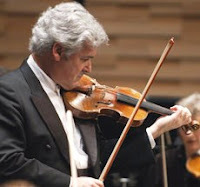 A quote from a review of the concert has become famous: "All that great violinists do, he did." As a teenager, he went to Berlin for further study. He toured Europe in 1932 (age 14) and continued his worldwide concertizing until 1942. During the Second World War, he played hundreds of concerts everywhere as an enlisted man (1942-1945.) His repertoire includes over 50 concertos, myriads of solo violin works, sonatas, and showpieces. There are several videos of his playing on YouTube, though some are sound-only uploads. One of them is here. His discography is enormous – over 500 recordings. In fact, he has recorded the complete Paganini Caprices no less than four times, the first one dating from 1947 (he was the first to do so) and the last one from 1988. On one of his interesting recordings he plays 16 different cadenzas for the Brahms concerto. Jascha Heifetz, Louis Kaufman, and Steven Staryk might rival him in the recording sphere - they also have enormous discographies. 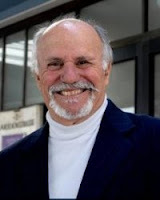 Ricci has taught at Juilliard, Indiana University, and at the Mozarteum (Austria), among other schools. His book on left hand technique is a classic. Ricci played his last concert in the U.S. in October, 2003, in Washington D.C., having already given over 5000 concerts during his 75-year career. In all those years, he played many violins - a 1731 Guarnerius, a 1734 Guarnerius, a 1771 Balestrieri, a 1780 Storioni, a 1714 Stradivarius, and a Vuillaume (with double purfling) from an undetermined year. The 1714 Stradivarius has had at least 18 different owners but only 3 have been musicians. 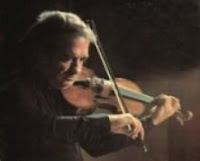 In 1995, Ricci commissioned a violin from modern luthier Samuel Zygmuntowicz. The violin was a copy of the famous Plowden Guarnerius Del Gesu. It was sold in 2012 for about $65,000. 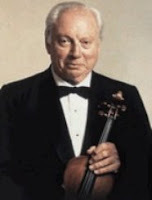 Robert Mann is an American violinist, composer, conductor, and teacher born on July 19, 1920 (Heifetz was 19 years old.) More than anything, he is identified with the Juilliard String Quartet, which he founded (as first violinist) in 1946. As violinists go, he actually got a late start, beginning lessons, not at age 4 or 5, but at the age of 9. When he was 18, he enrolled at Juilliard. One of his teachers there was Edouard Dethier. He made his New York debut in 1941 but was not able to begin his career – due to the war - until 1946. He devoted a great deal of his time to the quartet, from which he finally retired in 1997. Mann’s discography covers virtually the entire quartet literature. However, he has also recorded as a soloist, including the entire set of Beethoven Sonatas for violin and piano. His compositions include many chamber music works and a few orchestral pieces. All of them have been performed and most of them have been recorded. At age 68, he made his conducting debut with the Seattle Symphony. Mann has taught at Juilliard and at the Manhattan School of Music. 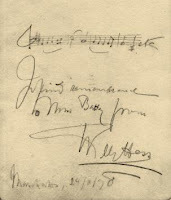 Willy Hess was a German violinist and teacher born on July 14, 1859 (Brahms was 26 years old.) He first studied with his father, who was a student of Louis Spohr, and later with Joseph Joachim. He was the concertmaster of the opera orchestra in Frankfurt from 1878 to 1886. Thereafter he taught violin at the Rotterdam Conservatory from 1886 to 1888. He then left to sit first chair in the Halle Orchestra (1888-1895.) From there, he went to the Cologne Conservatory (1895-1903.) For six years he was the concertmaster of the Boston Symphony Orchestra (1904-1910.) While there, he also taught at Harvard University. In 1910, he moved back to Berlin to teach violin at the Hochschule (Academy for Music) after receiving an invitation some time in March of that year. Hess worked closely with composer Max Bruch for a time and even premiered some of his violin works. Adolf Busch, Henri Temianka, and Arthur Fiedler were among his many students. It has been said that Hess was a tall and slender man, in the style of Paganini. He also sometimes sported a beard. I have no photos of him, only his autograph, with a quote from the Beethoven violin concerto. Hess died in Berlin on the eve of World War Two - February 17, 1939. Jan Kubelík was a Czech violinist and composer born on July 5, 1880 (Brahms was 47 years old.) His first lessons were with his father, who was an amateur violinist. At age 8, he entered the Prague Conservatory where he studied with Otakar Sevcik. He began concertizing ten years later (1898), the same year he graduated from the Conservatory. 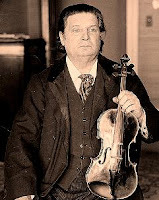 Along with Joseph Joachim and Pablo De Sarasate, he was one of the first violinists to be recorded in the early 1900s. Following debuts in Vienna and London in 1900 and 1901, he toured the U.S. for the first time in 1901, starting out in Carnegie Hall on December 2, 1901. At that first U.S. concert, Kubelik was criticized for being a mere showman. However, he enjoyed great financial success everywhere he went. He was a society darling and was already wealthy in his mid-twenties. Carl Sandburg even titled a poem after him. In the latter part of his career, he played the Emperor Stradivarius (1715.) In 1903, Kubelik married Countess Marianne Czáky Szell and eventually became the father of (among others) conductor Rafael Kubelik. As late as 1930, he was still being hailed as the best-known name in the violinist world. 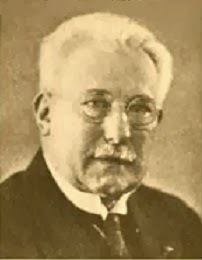 Kubelík also wrote music, including six violin concertos which are now never played, and cadenzas for the violin concertos of Brahms, Beethoven, Paganini, and Mozart. A number of his recordings are posted on YouTube. Jan Kubelík died in Prague on December 5, 1940, having never actually retired. 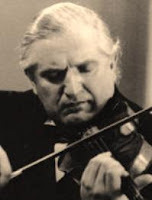 Tibor Varga was a Hungarian violinist and conductor born on July 4, 1921 (Heifetz was 20 years old.) Like so many other great violinists, he was a child prodigy. He studied with Carl Flesch and Jeno Hubay at the Franz Liszt Academy in Budapest. Varga joined a select group of distinguished Hungarian violinists who came before him – Joseph Joachim, Leopold Auer, and Carl Flesch. He could play the Mendelssohn concerto (e minor) from age ten and began his recording career at age 13. At 14 he began concertizing in Europe. In 1947, at age 26, he moved to London and later became a British citizen. Nevertheless, he later (from 1955 on) spent a great deal of time in Germany and Switzerland. Varga worked with the world’s leading orchestras and conductors before starting a long teaching career. A music school he founded in Germany underwent several transformations before he died. A pupil of his became the first female member of the Berlin Philharmonic (1982.) Tibor Varga died in Switzerland on September 4, 2003, at age 82.